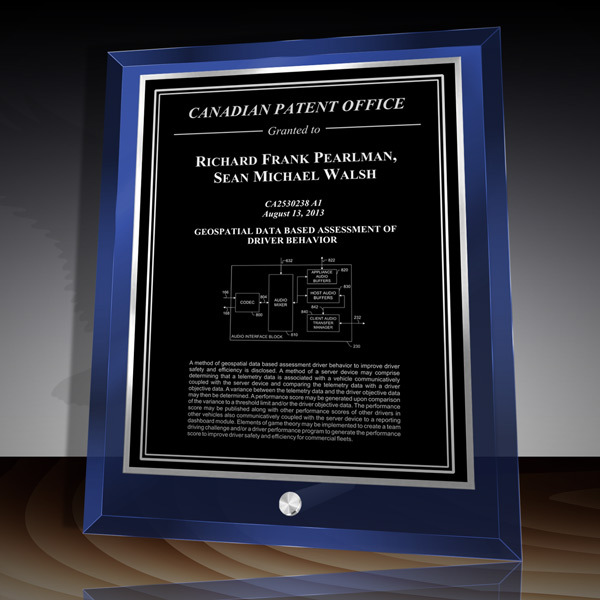 This patent plaque offers a bold combination of contemporary vivid blue glass, a premium engraved black metal plate with silver text, and a bright silver trim. All plaques include satin silver hardware for easy displaying. This plaque is perfect for any desktop or office display area. Available in five popular layouts including the option for a custom design. Layout one is not recommended due to size. 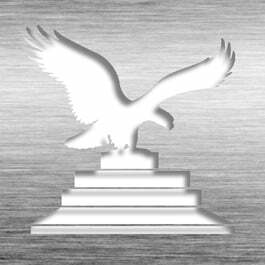 Precision laser-etching on our black plates produces a beautifully sophisticated style with a personalized touch. Layout can be customized to your specifications. Logo and images can also be included at no additional cost. Also available with our Silver HD or Gold HD Plates. This Patent Award - Glass Desk Plaque Blue DG-10EBBu is part of our Patent Desktop Award Series of products, check out other products & options available in the Patent Desktop Award Series of our selection. This Patent Award - Glass Desk Plaque Blue DG-10EBBu can be modified to your requirements and is available for your corporate award programs.